1328 East 43rd Court :: Tulsa, OK 74105 :: 800.597.5460 :: Conference.ReliablePlant.com Jim Fitch, CEO . . . . . . . . . . . . . . . . . . . . . . . . . . . . . . . . . . . . . . . . . . . . . . . . . Noria Corporation Jason Sowards, Editor-in-Chief. . . . . . . . . . . . . . . . . . . . . . . . . . . . . . . . . . . Noria Corporation Jeremy Wright, Vice President of Technical Services . . . . . . . . . . . . . . . Noria Corporation Diane Closser, Independent Solutions Provider . . . . . . . . . . . . Closser Lubrication Services Cary Forgeron, National Sales Manager . . . . . . . . . . . . . . . . . . . . . . . . . . . . . . . Analysts, Inc. Thomas Hiatt, Senior Supervisor, Facility Maintenance and Instrument Support . . Covance, Inc. Ted Melencheck, Maintenance Reliability Supervisor . . . . . . . . . . . . . . . . . . . . . . . . . . Cargill Jerry Putt, Technical Consultant/Contractor . . . . . . . . . . . . . . . . . . . . . . . Goodyear, retired Daniel Rader, Reliability Engineering Supervisor . . . . . . . . . . . . . . . . . . . . . . . . . . . . . . . OG&E Dave Wooton, Consultant/Engineer . . . . . . . . . . . . . . . . . . . . . . . . . . . . . Wooton Consulting 2014 ADVISORY COUNCIL The Reliable Plant Advisory Council is comprised of industry experts who share their knowledge, experience, opinions and time to assure that the annual conference exceeds attendee and exhibitor expectations. These individuals convene to advise, share fresh perspectives, gauge future trends, evaluate and debate issues, and arrive at a mutual consensus for enhanced programs and strategic approaches. 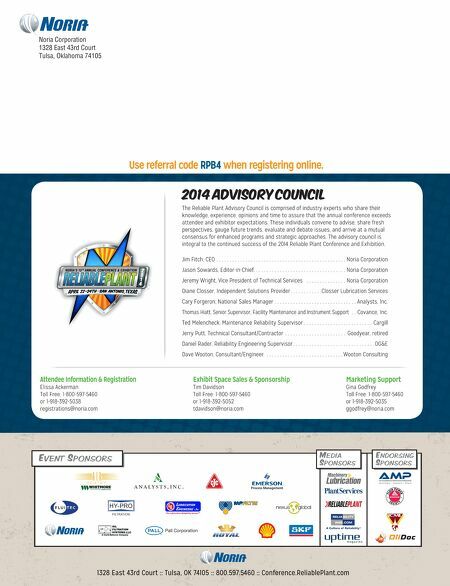 The advisory council is integral to the continued success of the 2014 Reliable Plant Conference and Exhibition. Attendee Information & Registration Elissa Ackerman Toll Free: 1-800-597-5460 or 1-918-392-5038 registrations@noria.com Exhibit Space Sales & Sponsorship Tim Davidson Toll Free: 1-800-597-5460 or 1-918-392-5052 tdavidson@noria.com Marketing Support Gina Godfrey Toll Free: 1-800-597-5460 or 1-918-392-5035 ggodfrey@noria.com QUESTIONS? 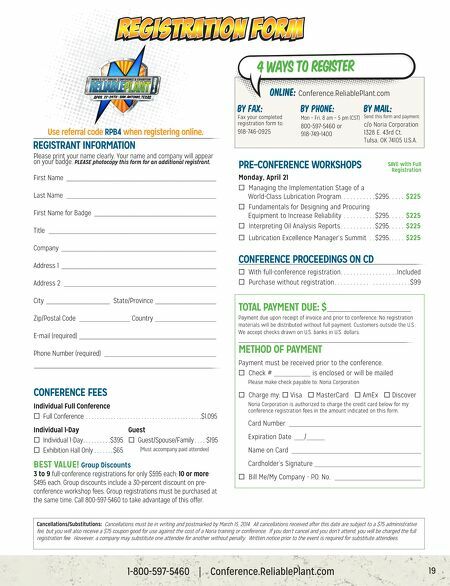 EVENT SPONSORS ENDORSING SPONSORS MEDIA SPONSORS 2 0 1 4 NORIA'S 15 TH ANNUAL CONFERENCE & EXHIBITION NORIA'S 15 TH ANNUAL CONFERENCE & EXHIBITION Noria Corporation 1328 East 43rd Court Tulsa, Oklahoma 74105 Use referral code RPB4 when registering online.